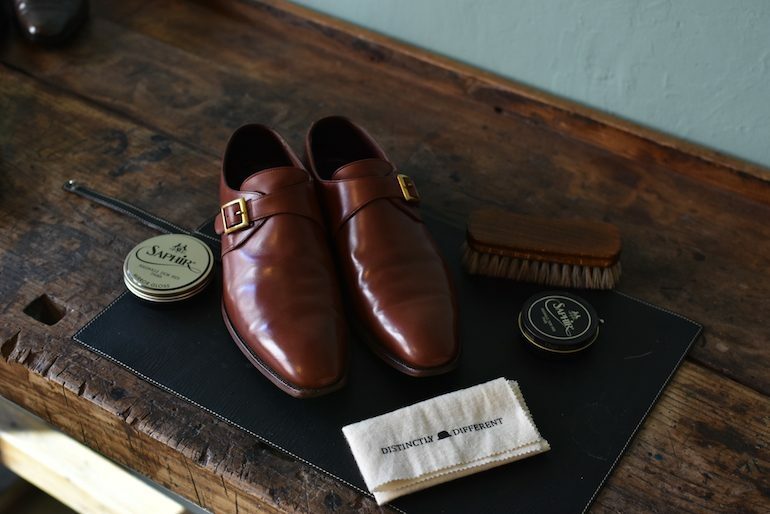 It’s time for another Shoe Revival article which we did in February, this time a pair of Crockett & Jones Savile Single Monk Strap (mahogany) is what we working with. Because of the spots and damages on the shoes we first started stripping the shoes with Renomat (3x), to get rid of dirt and old cream and wax layers. Saphir Renomat is great for removing any old shoe polish, but also takes care of most types of stains. 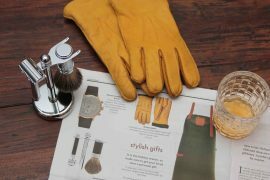 Now that the leather is liberated from all those dried out layers of polish it is the opportune moment to renovate the leather using Saphir Renovateur. 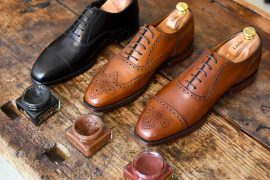 Afterwards we used Saphir Pommadier cream to bring the shoe back to its original colour. In this case, we used the colour mahogany. As with most pairs, we finished the revival by giving the shoes a good mirror shine. Which we did with Saphir Médaille d’Or Mirror Gloss and Saphir Médaillle d’Or Pate de Luxe. We first applied a layer of Pate de Luxe to the entire shoe. Afterward, you give them a quick shine using a brush. Moving on to the Mirror Gloss. The first two applications we use a fair amount of shoe wax. This is to fill out the structure of the leather. The wax hardens and creates a smooth surface which you make shiny by buffing it with a cloth. It is also perfectly fine to use a brush to quickly shine these two first layers of Mirror Gloss. Just make sure to be thorough. Layers 3-5 we continue to apply and shine Saphir Mirror Gloss, but now we only use cloths for the shining. Apply small amounts of wax from now on, let the wax dry for a minute and then shine the wax using your cloth. Use circular motions and make sure not to put too much pressure while shining. This can cause you to rub the wax off the leather which you just applied. The weight of your fingers is sufficient pressure most of the times. End your mirror shine with a layer of Pate de Luxe. Pate de Luxe contains more solvent and oil than Mirror Gloss. That is why it is categorized as a soft wax compared to Mirror Gloss. The solvents and oil will smoothen out the hard mirror gloss making it an even more glossy surface than before. Also sometimes the Mirror Gloss will “fog up”, you can use Pate de Luxe to cure this as well. 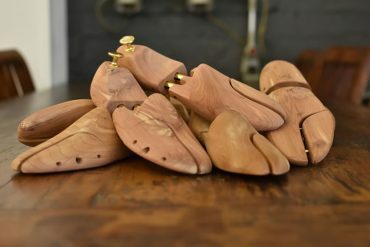 *Almost in all cases we choose to only mirror shine the nose and heel part of the shoes since those are the inflexible parts of the shoes. Wax dries up as a hard layer and will crack when flexed during walking. Last, but not least we treated the sole edges with brown shoe wax. In our opinion, these Crockett & Jones recovered the best out of all the pairs that we restored. Keep them in good shape!